I didn’t rely on regular expressions here, but wrote a simple forwarding parser to process markup text. As it makes a pretty neat tool, I extracted it into a little sample app that shows a possible use for it. The presented implementation just creates nested text blocks, but you should be able to easily adjust it to your needs. 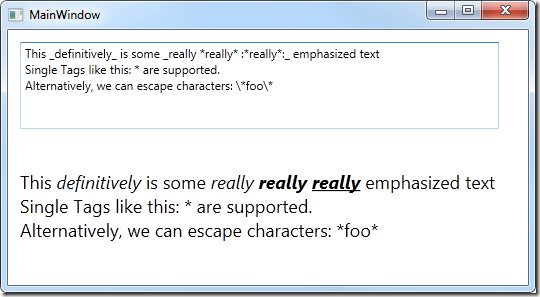 Latest Update: 2010.11.07 – Fixed issue with single character chunks. Look for FormattedTextConverter on http://wpfcontrib.codeplex.com/. Hi Philipp, That’s pretty neat. Nice and simple. I can see myself using this in the future. @Sacha – I feel quite comfi in XAML land.